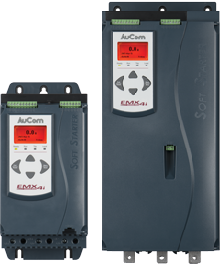 Like its predecessor, the EMX4 Soft Starter sets new standards for soft start technology. The EMX4 is not only smaller, more powerful and packed with new control and protection features, it also introduces the game-changing Smart Card capability. Fitting a Smart Card to the EMX4 transforms it from super smart motor controller to complete system controller. This is truly a starter for the future. Smart does not have to mean complex. While the EMX4 offers more functionality than ever before, it has been designed to make your life easier. By enhancing the display and connectivity functions, and making them intuitive, it is easier to access the right information when you need it, enhancing your overall efficiency. The EMX4 includes starter, motor and system protection functions, complete with alarms to alert you to any potential issues. In the event that the worst does happen, Power Through and Emergency Run functions give you the power to choose to keep running. Now you can start smart. 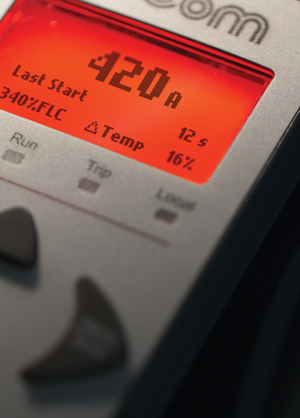 The EMX4 Smart Card redefines the role of a soft starter. 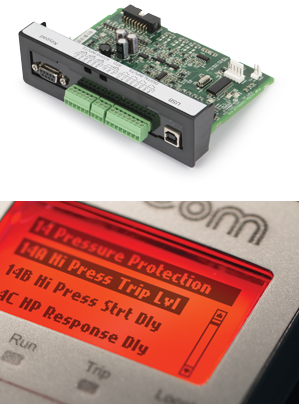 With the appropriate Smart Card installed the EMX4 is able to operate as an entire system controller. Smart Cards deliver industry or application specific functionality and are easily inserted into the EMX4, simplifying system design, installation and set-up. By transforming your EMX4 with an industry specific Smart Card, your system can be purpose-built around one central point of intelligent control and communications. Utilising this technology will improve overall efficiency of your system, and put you firmly in control. Design of energy efficient systems requires consideration of the system as a whole. Using energy efficient components is important but selection of the correct motor control mode (fixed or variable speed) is also critical. Approximately 80% of motor applications are most efficiently operated at a fixed speed. Using a Variable Speed Drive (VSD) with such a system is hugely inefficient, regardless of the efficiency of the motor you are running. The use of IE3 motors offers the opportunity to maximise efficiency and save on operating costs. We have developed the EMX4 Soft Starter to be an ideal partner for running IE3 motors. The AuCom Pocket Technician app puts the tools you need to troubleshoot issues with starting and starter operation in the palm of your hand. Easily retrieve useful data from EMX4 soft starters to help diagnose problems. Review the information yourself or share it with your local support team - all at the click of a button. 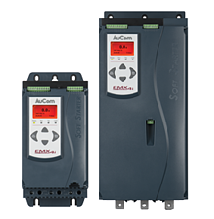 Like its predecessor, the EMX4i Soft Starter sets new standards for soft start technology. The EMX4i is not only smaller, more powerful and packed with new control and protection features, it also introduces the game-changing Smart Card capability. Fitting a Smart Card to the EMX4i transforms it from super smart motor controller to complete system controller. This is truly a starter for the future. Smart does not have to mean complex. While the EMX4i offers more functionality than ever before, it has been designed to make your life easier. By enhancing the display and connectivity functions, and making them intuitive, it is easier to access the right information when you need it, enhancing your overall efficiency. The EMX4i includes starter, motor and system protection functions, complete with alarms to alert you to any potential issues. In the event that the worst does happen, Power Through and Emergency Run functions give you the power to choose to keep running. 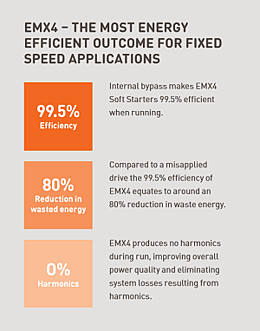 The EMX4 Smart Card redefines the role of a soft starter. With the appropriate Smart Card installed the EMX4i is able to operate as an entire system controller. Smart Cards deliver industry or application specific functionality and are easily inserted into the EMX4i, simplifying system design, installation and set-up. By transforming your EMX4i with an industry specific Smart Card, your system can be purpose-built around one central point of intelligent control and communications. Utilising this technology will improve overall efficiency of your system, and put you firmly in control. The use of IE3 motors offers the opportunity to maximise efficiency and save on operating costs. We have developed the EMX4i Soft Starter to be an ideal partner for running IE3 motors.